Luxury, elegance, sleek sophistication, spectacular views are just a few words to describe this magnificently renovated penthouse. Come and experience the ultimate living style usually found in NYC, but conveniently located in Fairfield County. 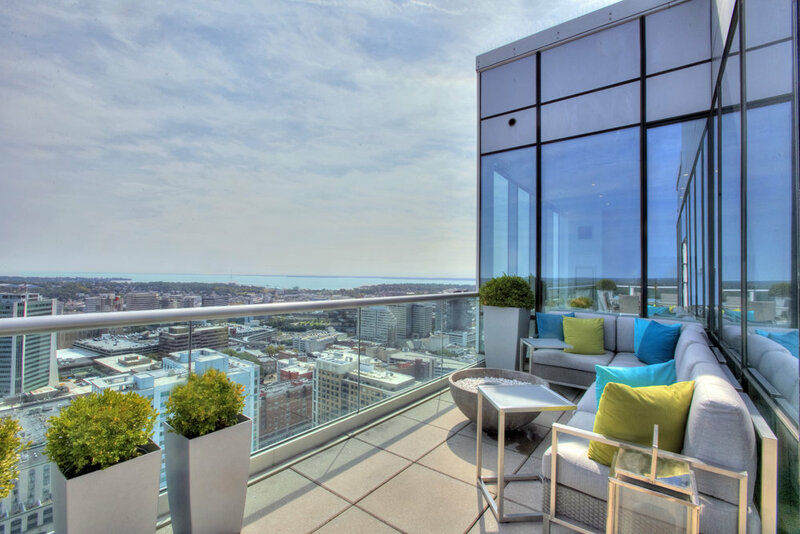 This two story, 3264 square foot penthouse boosts vista city views, as well as serene views of Long Island Sound, from virtually every room and outdoor terrace. The modern interiors include soaring ceilings, custom lighting and beautiful built-ins. Every room has been designed with the utmost quality, style and attention to detail and are simply gorgeous! Some of the fabulous features include expansive living room with crystal linear fireplace, dining area with butler’s pantry wet bar & Viking wine cooler, stunning chef’s kitchen with Calcutta Gold waterfall-edged center island, Caesar stone countertops, top of line appliances and a wonderful family-sitting room. Retreat and relax in the luxurious master suite, located on a separate floor, with sitting area, private terrace, custom dressing room and sumptuous spa-like bathroom. Two additional well-appointed en suite bedrooms complete the bedroom floor. Private club living style is enjoyed with the many amenities offered in this luxury building…indoor lap pool, fitness, sauna, entertaining rooms and patios, doorman and concierge.